Recurring subscription is nothing but auto-renewal. J2Store's Subscriptions and Memberships app allows you to create recurring subscription. If you create recurring subscription, the customers can auto renewal his subscription plan. The example given below, assumes you have a store and selling hosting service and wants to collect $99 at the end of every 6th months. 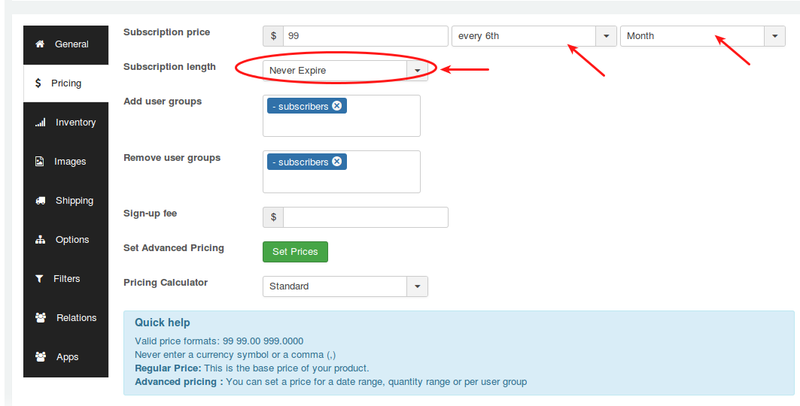 Choose product type either Simple Subscription or Variable Subscription. Enter the price $99 in the price text box. Next to price text box, you can see two dropdowns. In the first dropdown, choose every 6th and choose month from second dropdown. Set Never Expire to Subscription length. Choose your usergroups and save. How to create a non-recurring (one term) subscription plan? Non recurring is a single term subscription in which the subscription will be terminated at the specific period and does not allow for auto renewal. Subscriber will have to subscribe for the plan next time manually. Lets see an example for single term subscription. For example, consider you are providing service for $129 for one year. Enter the price $129 in the price text box. Next to price text box, you can see two dropdowns. In the first dropdown, choose every and choose year from second dropdown. Set 1 Year to Subscription length.